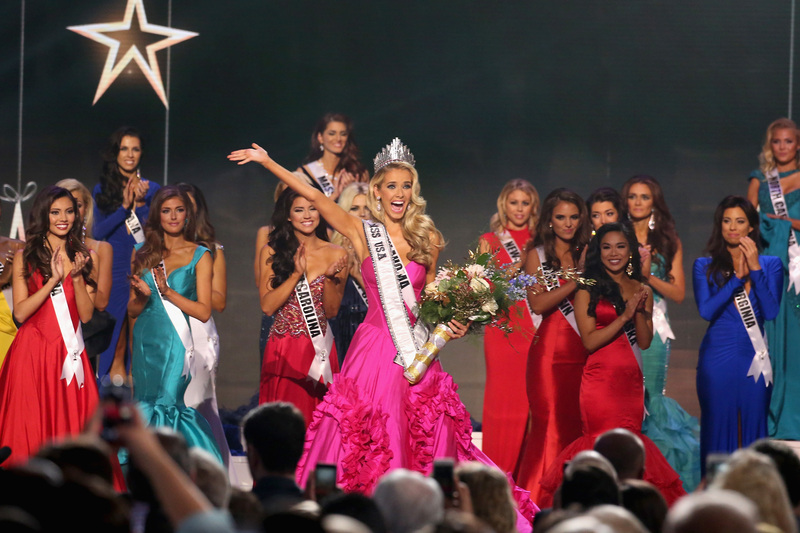 Like all of the years and pageants before it, the interview round of the 2015 Miss USA pageant was a great lesson in Murphy's Law: If anything can go wrong, it will. The only thing more unsurprising than how much the Q&A portion of the show makes people cringe is why anyone is surprised. After all, the contestants are given mere seconds to answer complicated questions that even the most intellectually nimble academics would have trouble tackling — remember when the rival Miss America pageant asked Miss Virginia about ISIS? To her credit, Courtney Garret handled the question with aplomb, but still: This is a beauty pageant. Can't we all just calm down a little? I'm not sure why the particular questions are chosen, but I know that the Miss USA judges are responsible for writing them, save for one question that came from a lucky Facebook fan. Needless to say, despite the type of subject matter that finds its way to the contestants, it's definitely entertaining to watch — even if it does make us shift in our seats a little more than we'd like to. These were some of my favorite bizarre questions asked of this year's contestants, along with how well each of them dodged — or bit — the bullet. 1. What's the next big national issue we need to tackle? Miss Oklahoma won the whole competition, and after I heard her answer, I totally knew she would. She simply responded with, "Improve race relations." Truer words have never been spoken. 2. Last year, CEOs made 300 times as much as the average worker. Should government impose boundaries on this? Miss Texas seems to think that the reason CEOs make so much money is because they "work hard for their money and should be able to attain what they work for." Call me crazy, but I'm pretty sure that's oversimplifying things a bit. Unsurprisingly, I disagree with a person from Texas. 3. Jerry Seinfeld made comments about political correctness in America. Do you think political correctness is hurting or helping this country and why? "I think it's a balance of both," said Miss Rhode Island. "I think it's good we have the politicians to remind us to do what is right and wrong." She got cut off at that point, which is good because A: She thinks Jerry Seinfeld is a politician; and B: She thinks politicians should be our moral compass. I'd call this one a full-fledged fail. 4. The USA has agreed to formally reopen the embassy in Cuba. Will this be a good thing? Miss Maryland answered this question, and she generally thinks that it's important for countries "not to hold on to old grudges." I would agree, but that might only be because I want to wear white linen pants on the streets of Havana. 5. What would you do to improve race relations in the United States? To her credit, Miss Nevada got a ridiculously complicated question, and her tactic was to give an oversimplified answer, saying, "I think what we need to do is be more accepting of each other and bring people together." That's what's at the heart of it all, isn't it?